ONE DAY, WHEN MY CHILDREN ARE GROWN, I HOPE THEY STILL COME - ProudMummy.com the Web's Community for Mums. ONE DAY, WHEN MY CHILDREN ARE GROWN, I HOPE THEY STILL COME THROUGH THAT FRONT DOOR WITHOUT KNOCKING. I HOPE THEY HEAD TO THE KITCHEN FOR A SNACK, AND RIFLE THROUGH THE MAIL LOOKING FOR A MAGAZINE THEY ALWAYS READ. I HOPE THEY COME IN AND FEEL THE WEIGHT OF ADULTHOOD LEAVE THEM, FOR THEY ARE HOME. 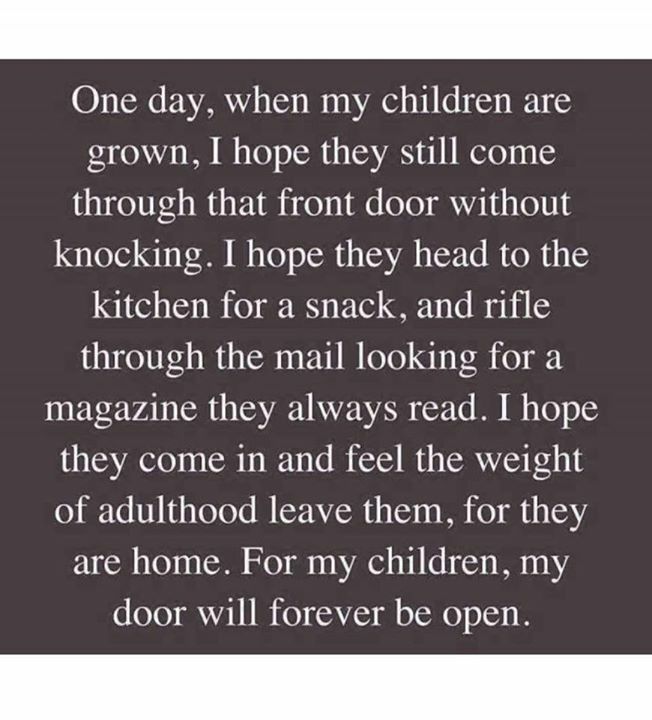 FOR MY CHILDREN, MY DOOR WILL FOREVER BE OPEN.